Highschool Flirt is a chic creamy latte-pink colour which I thought initially was a odd shade to include with the punchier shades in this Special Edition range. I find it quite neutral in tone on me but it does have undertones of pink going through it. It's similar to Revlon Bare Bones but a little pinker and not quite as white as Essie Fiji. Titled Blue is a beautiful navy blue, its not actually that dark as it still has a "bright" sort of quality to it. This is opaque in one coat, but I've swatched with two for the sake of continuity. I personally don't like dark blue nail polishes, I don't know why but they just seem to age my hands. Again I felt this was a odd shade to include in a Spring Summer Special Editon collection but it somehow works with the other shades. Tropicana is a sweet and punchy typical-summer-shade of reddish coral, while it's not very new or interesting but this also could be one coat and go. I think it's a lovely shade but it just doesn't quite wow me and just comes across very blah and dupable, not special enough for a limited edition collection. Greed is a clear polish packed full of gold hexagonal glitter and smaller gold pieces. I love a mix of chunky and small glitters in a polish and this really ticks that box. The yellow gold particles are super sparkly and this could be used for layering up with other shades or built up to give a full glitter nail. 100% Bling! Girls on Film has to be the standout shade within the collection. It's predominately pale pink but has multicoloured sparkles suspended in a clear polish. The polish just screams diamonds. This would look amazing layered over a light pink base colour but at the Press Event one of the girls had it layered up to full opacity and it looked stunning. Despite being a glitter addict I don't actually own anything like this and it would definitely be classed as the most unique shade within the collection. All of the GOSH nail polishes apply really well. I was actually impressed with how smoothly they applied. I had mine done at a Nail Salon as I bought my own polish in for them, For the record I'm not really lazy, I was just getting infills and thought I'd kill two birds with one stone! Most are one or two coats opaque, obviously the glitters need a few more to be built up though. 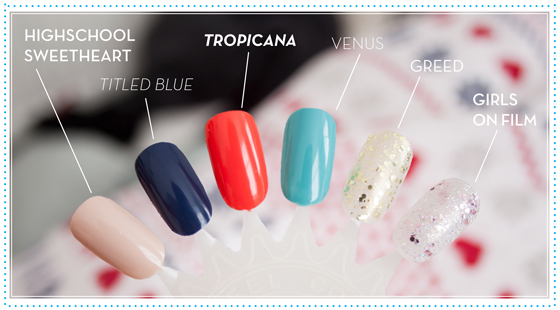 The polishes all have a lovely creamy, full opaque glossy finish (obviously not the glitters again!) and dry in an average time. I cant comment on the wear time as obviously we all use different base and top coats. 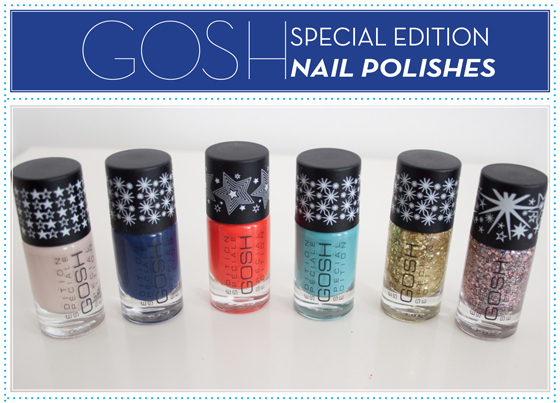 But none the less, I'm very impressed with my first foray into the world of GOSH cosmetics and especially their nail polishes. Overall the collection screams nautical (my least favourite SS trend!) but it does work and I can see these being very wearable summer shades. Might be worth popping down to your local Superdrug to check out once they launch!